Gov. Scott Walker today announced campaign leaders in every one of Iowa’s 99 counties, a show of strong and widespread support for his candidacy in the first-in-the-nation caucus state. With the backing of this county leadership team, Walker’s already robust, active organization grows as he campaigns to win the Iowa caucuses on February 1. 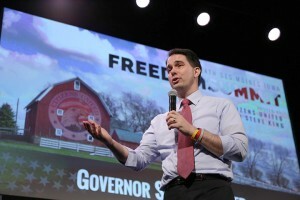 Walker earlier announced the first round of his statewide leadership team, which includes nine state senators, six state representatives, and numerous other current and former elected officials, business leaders, and party activists. Each of these Iowans knows Gov. Walker as a fighter and a winner with a proven record of reform in neighboring Wisconsin, and they’ve chosen to help him win the Iowa caucuses because they know he has what it takes to do the same for America. Team Walker will be announcing additional Iowa leadership in the coming weeks. Brenda Wallace, Greenfield, Adair County; Rex Townsend, Corning, Adams County; Bob Hager, Waukon, Allamakee County; Allyson Callen, Moulton, Appanoose County; Bruce Hoegh, Exira, Audubon County; Robert McGee, Vinton, Benton County; Ron Wheeler, Cedar Falls, Black Hawk County; Lura Stukenholtz, Boone, Boone County; Janice and Merlin Dietz, Plainfield, Bremer County; Craig Bussan, Independence, Buchanan County; Dennis Weber, Alta, Buena Vista County; Eric Kruse, Allison, Butler County; Theresa Hildreth, Rockwell City, Calhoun County; Brian Best, Glidden, Carroll County; Tracey Marshall, Atlantic, Cass County; Shirley Geadleman, Clarence, Cedar County; Gary Jochimsen, Swaledale, Cerro Gordo County; Todd Anderson, Cherokee, Cherokee County; Denny Litterer, Ionia, Chickasaw County; Bill Kersting, Spencer, Clay County; Barb Pape, Guttenberg, Clayton County; Mark Reiland, Clinton, Clinton County; Mark Segebart, Vail, Crawford County; Chad Airhart, Waukee, Chad Leonard, Dallas Center, Debora Blume, West Des Moines, Julie and Scott Cirksena, Clive, Dallas County; Delorris Lauman, Floris, Davis County; Barry Peterson, Garden Grove, Decatur County; Dan Zumbach, Ryan, Delaware County; Karen Kuechmann, Danville, Des Moines County; Barb Clayton, Spirit Lake, Dickinson County; Cheryl Kramer, Dubuque, Jeff Walters, Peosta, Matt Giese, Dubuque, Dubuque County; John and Julie Clark, Estherville, Emmet County; Nicole Gamez, West Union, Fayette County; Lola Losee, Marble Rock, Floyd County; Helen Wall, rural Alden, Franklin County; Iris Morrison, Shenandoah, Fremont County; Lindsey Larson, Jefferson, Phyllis Gannon, Grand Junction, Greene County; Becky and Jordan Dirks, Grundy Center, Grundy County; Vinita Smith, Panora, Guthrie County; Cliff Hayes, Webster City, Hamilton County; Terry Baxter, Garner, Hancock County; Machel Eichmeier, Ackley, Hardin County; Carl Rorden, Jr., Magnolia, Harrison County; Dean Hamilton, Mount Pleasant, Henry County; Pat Schumann, Riceville, Howard County; Jana Bratland, Dakota City, Humboldt County; Vera Varner, Ida Grove, Ida County; Ryan Neumann, Williamsburg, Iowa County; Darlene Block, Maquoketa, Jean Davidsaver, Bellevue, Jackson County; Omar Hummel, Newton, Jasper County; Barb Hischler, Fairfield, Jefferson County; Jack Cameron, Coralville, Johnson County; Lee Hein, Monticello, Jones County; Jack Hayes, Hayesville, Keokuk County; Dennis Swanson, Swea City, Kossuth County; Melody Slater, Montrose, Lee County; Brenda Hart, Cedar Rapids, Carole Boddicker, Cedar Rapids, Curt and Norma Hames, Marion, Jim Dvorsky, Cedar Rapids, Kathy Pearson, Cedar Rapids, Laura Skogman, Marion, Rob Gettemy, Marion, Linn County; David and Kaye Perley, rural Muscatine, Louisa County; Jerry Book, Chariton, Lucas County; Linda Wessels, Rock Rapids, Lyon County; Dave LaGrange, Winterset, Madison County; Elizabeth Van Steenis, Oskaloosa, Mahaska County; Abbie Flanders, Knoxville, Marion County; Jarret Heil, Haverhill, Jeff Heil, Haverhill, Marshall County; Ron Romine, Henderson, Mills County; Betty Hanson, Osage, Mitchell County; Robert Hewitt, Onawa, Monona County; Erik Barber, Albia, Monroe County; Len Taylor, Red Oak, Montgomery County; Alan Ostergren, Letts, Muscatine County; Susan Meyers, Sheldon, O’Brien County; Tommy Zylstra, Sibley, Osceola County; Tyler Maher, Shenandoah, Page County; Dorothy Moore, Ruthven, Palo Alto County; Bruce Gitlin, Kingsley, Dan Smith, Merrill, Plymouth County; Mike Diischer, Pocahontas, Pocahontas County; Arthur and Norma Doenecke, Clive, Dixie Watters, Des Moines, Polk County; Kris Ranney, Council Bluffs, Pottawattamie County; Tammy Kriegel, Grinnell, Poweshiek County; Debbie and John Larson, Kellerton, Ringgold County; Caleb Hedeen, Early, Sac County; John Maxwell, Donahue, Scott County; Nancy Boettger, Harlan, Shelby County; Randy Feenstra, Hull, Sioux County; Dave Deyoe, Nevada, Story County; Dean Fisher, Garwin, Tama County; Marietta Cobb, Blockton, Taylor County; Kelly Busch, Creston, Union County; Norm Tyche, Cantril, Van Buren County; Terri O’Hara, Ottumwa, Wapello County; Julian Garrett, Indianola, Warren County; Diane Poch, Riverside, Washington County; Amy Sinclair, Allerton, Wayne County; Morgan Mills-Morlan, Fort Dodge, Webster County; Lee Iverson, Scarville, Winnebago County; Wayne Walter, Decorah, Winneshiek County; Ben Uhl, Sioux City, Woodbury County; Charlotte Cole, Grafton, Worth County; Paula Waters, Clarion, Wright County.